Hi everyone. I finally have a snow-map set up and ready. This storm will be a New England special with most of the 1 to 2 feet totals happening in Massachusetts and Connecticut. For this area we are looking at a fairly substantial snowstorm with a potential to put down 6-12 inches of snow in one night. My snow map is mostly based off of the NAM computer model released by noaa, but has shades of other model predictions as well. I believe that the battle zone for this storm will be anywhere east of Doylestown to Bordentown area. Every storm ends up doing something unexpected in the end, and right now with the complexity of the timing of the storm and when it will phase makes a surprise very possible tomorrow night. Timing: The storm should start by 11 PM and wrap up by 11 AMish. The snow will be heaviest during the 3-6 AM time period. 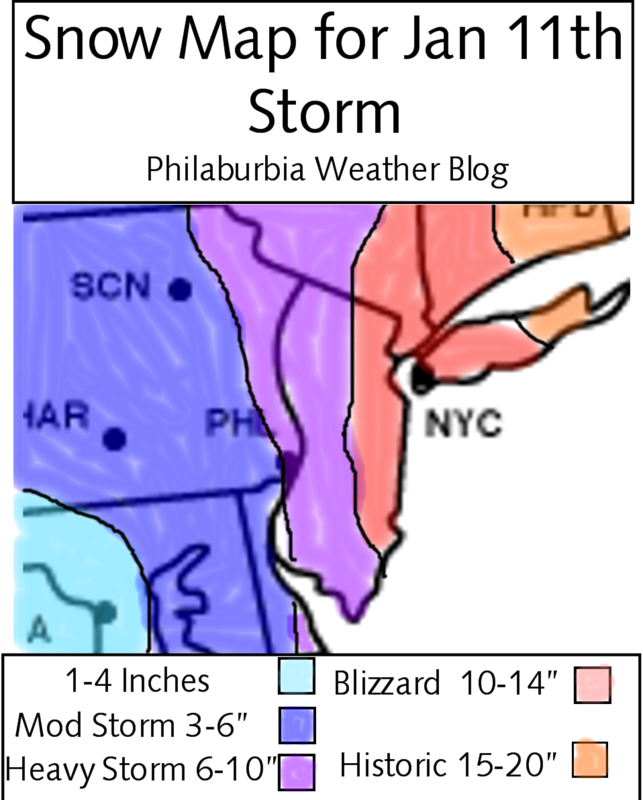 With that said, here is my snow map. I believe my totals are the best estimate of how much will fall tomorrow in the area. If any changes ensue over the next day, I will try and make revisions to the map. As far as school closings are concerned. I believe any school north of Philadelphia will be closed Wednesday. With the amount of snow that is going to pile by the late morning, I just don’t believe the salt trucks will be able to clear the roads in time. The morning commute Wednesday will be treacherous, so anyone going to work Wednesday, drive slowly and carefully.